Greetings, Earthlings! We’re excited to share with you a new party theme that we’re just over the moon about: an Outer Space birthday party. Great for aspiring astronauts, science fiction fans, and alien enthusiasts alike, our Outer Space party supplies really are out of this world. Not only does this theme work great for younger kids with big imaginations – it’s also fantastic for a 1st birthday party. 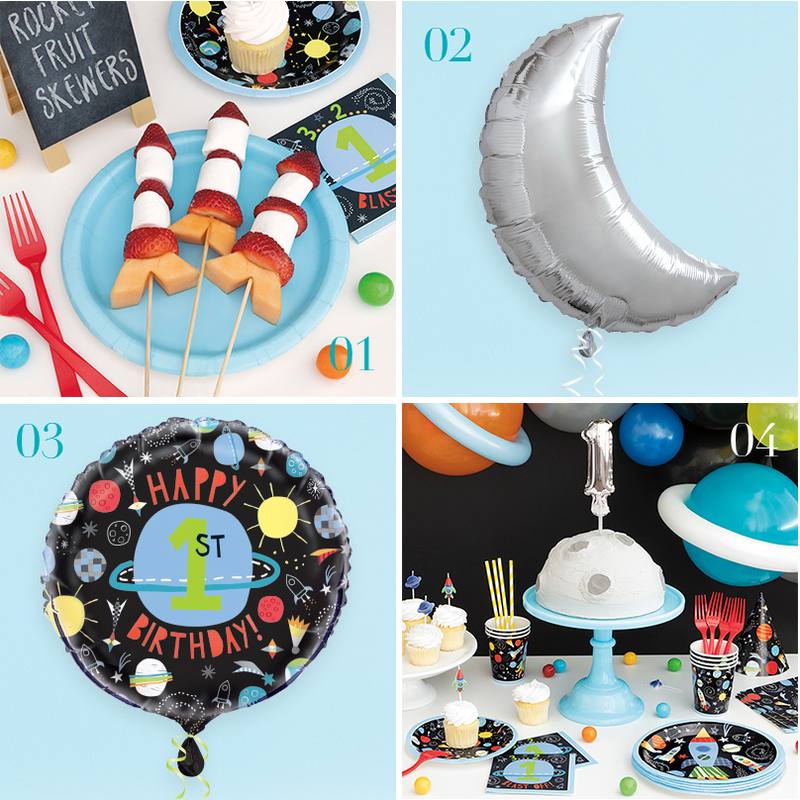 Some of our favorite designs include our Silver Moon Balloon (see image 2), Outer Space 1st Birthday Foil Balloon (image 3), and Outer Space Beverage Napkins that read “3, 2, 1… BLAST OFF!” (image 4). Keep on reading to learn how to celebrate a child’s first year around the sun. This awesome balloon arch took some skill to create, but in the end it was definitely worth the extra effort. 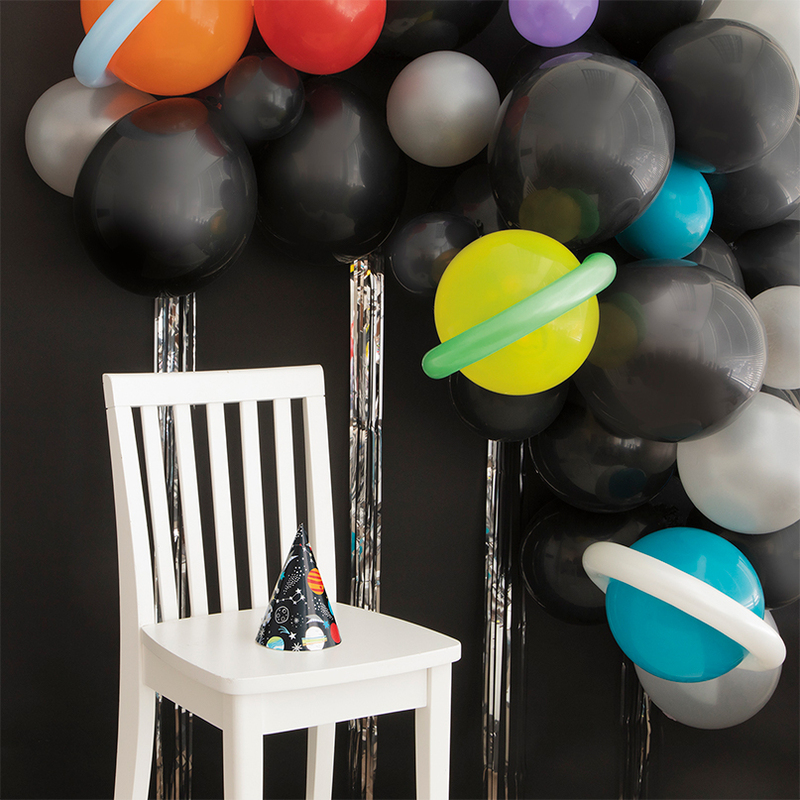 The globular shape of the balloons already instilled thoughts in our heads of distant planets, moons, and meteors, so turning them into a party backdrop seemed like the obvious choice. First, we taped together a mix of black and silver balloons in varying sizes (5”, 9” and 12”) to create the main piece. Then, we added colorful latex balloons with our Twist N’ Shape Balloons wrapped around them to make them look like planets. For the finishing touch, we cut and hung sections of our Silver Foil Fringe Door Curtain from the back of the installation. This dazzling decoration made the perfect place to pull up a chair so the mom and her one-year-old could sit and open presents after eating. All astronauts know that you never leave orbit on an empty stomach! That’s why we took the opportunity to make rocket ship fruit skewers (see image 1) and other fun treats for our guests to eat. The rocket ships were a cinch to put together. Using our bamboo skewers, we slid on slices of cantaloupe, strawberry, and some marshmallows, too. We also had tasty cupcakes on the table, decorated with our Outer Space Pick Birthday Candles, so there was something for everyone. We decided to make a moon-shaped smash cake for the tiny guest-of-honor, and we topped it off with our Foil Silver Number One Balloon Cake Topper (see image 4). For those unfamiliar with the concept, smash cakes are a popular first birthday trend, which involve having a tiny single-serve cake made specifically for the baby to enjoy (with their hands as much as their mouth). It’s a terrific way to get a child’s attention, especially if they’re easily distracted, or maybe more in the mood for a nap. In addition, it also happens to be a great way to set up some fun photo opportunities. Make sure to have a camera ready! We recommend putting a plastic tablecloth under your child’s high chair to help contain the mess. 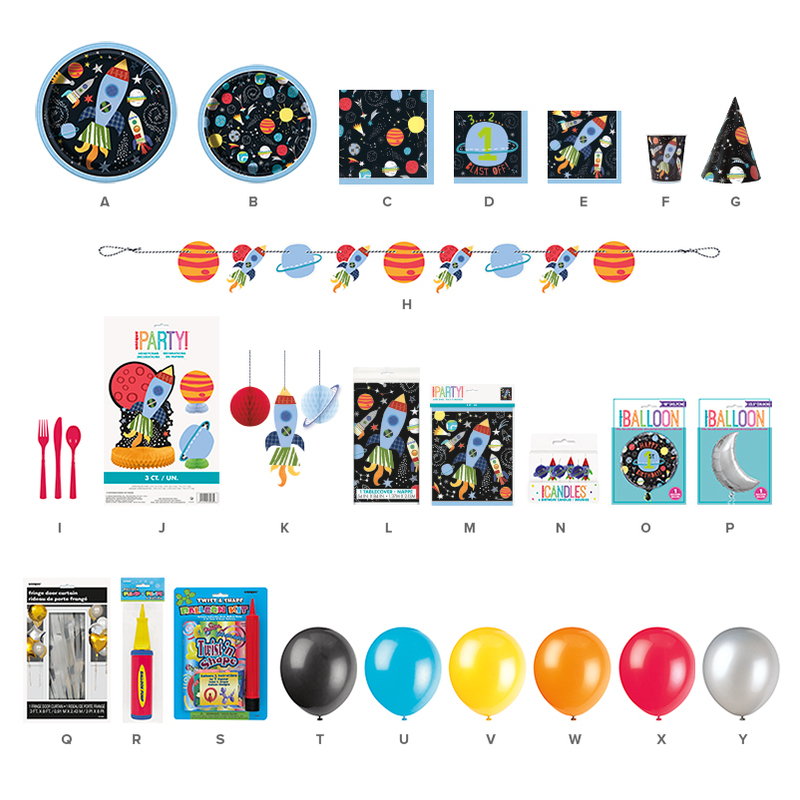 Filled with spaceships, planets, and shooting stars, our Outer Space party supplies are perfect for an Outer Space themed 1st birthday party. 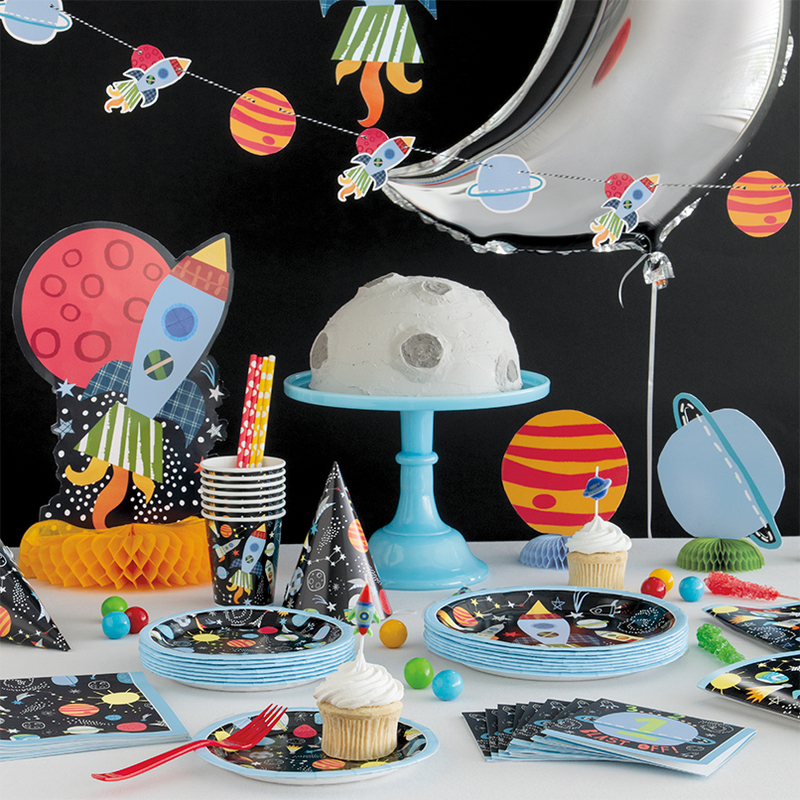 Don’t miss the chance to get in on this intergalactic event – stock up on our Outer Space themed party supplies today!